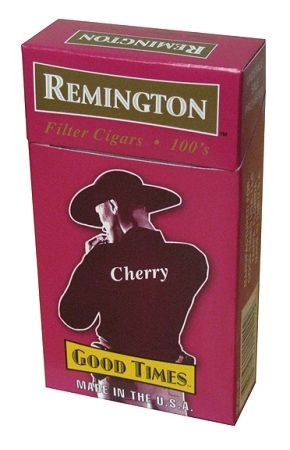 One Carton Remington Cherry 100 Box. 200 filtered cigars packed 20 Cigars to a Box-Pack, that adds to your enjoyable smoking experience. I used to buy these cigars from a local retailer but they never keep stock of these cigars. So, I was extremely pleased to find them here on this website as they are quite difficult to find surprisingly. I will just say I prefer these cigars over all other filtered cigars. They are strong in drawl as well as flavor and in my opinion are the best available and the price is affordable. I don't like all the flavors though so I will list the ones I like. Cherry, Peach, Vanilla and Chocolate. All other flavors I find unappealing. To be straight up the Rum flavored are nasty lol. Thanks very much to the owners of this website for carrying these cigars. If you keep these in stock, You will have a regular customer. Remington's are great little cigars. They are made in the USA (a plus for our work force) and have a good draw with a mild cherry flavor.